Doing Your Business: The Dungaroo: Odorless, waterless, economical... and enjoyable! The Dungaroo: Odorless, waterless, economical... and enjoyable! Back in June, when the idea of toilet entrepreneurs was still new to me, an article in Forbes caught my attention: “Check The Bathroom For Your Next Startup Idea” It was about a young American entrepreneur named Liz Morris, who had created a waterless toilet called 'The Dungaroo'. Liz seemed a woman after my own heart, and so I sent her an e-mail asking if she'd do an interview for my book, and she very kindly agreed. Skyping from our respective co-working office spaces we carried out my very first interview. She was a natural stand-up comic fully embracing the humorous side of the work, while staying thoroughly grounded in her project and in the knowledge of the problems she was tackling. When I talked with her in June they had only just released a prototype. This week the Dungaroo has launched an Indigogo campaign, so though the book is still an odd assortment of scribbles and articles sitting in folders marked "to read" it seems an appropriate time for this particular interview to see the light of day. The first thing I always want to know from anyone working in the Sanitation industry is how they got there. What makes a person think "you know what I'd like to do with my life? Create toilets!" Liz's story is a particularly good one. Her background is in product packaging. She earned her BA from the University of Florida and worked for companies like Kraft Foods in England. 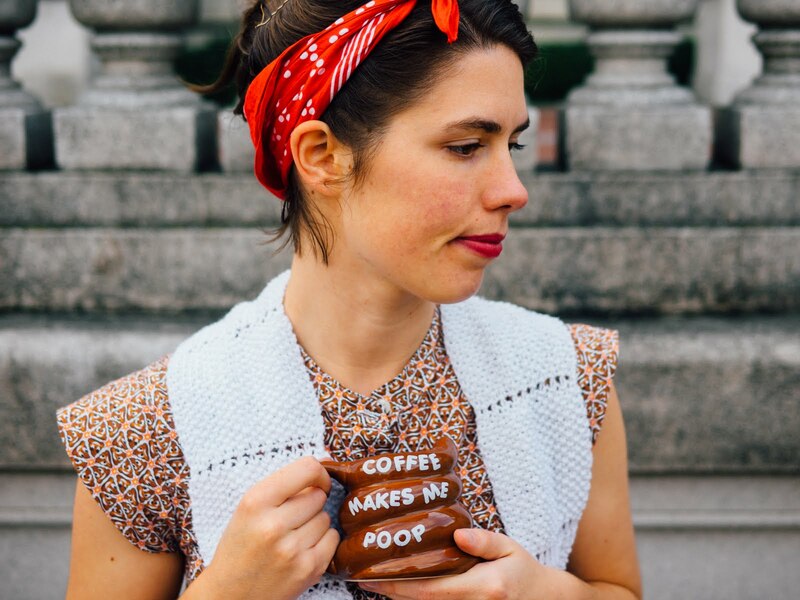 Her "ahha" moment came when one of her professors asked her "How would you package poo? "She went on to complete her Master's Degree in Environmental Sciences and Engineering in 2011, and came up with the Dungaroo. She told me "I realised I was spending more time doodling toilets than actually writing my thesis!" In toilet land waterborne sanitation is a big topic. We often think of a flushing toilet as the highest marker of a civilization. Well… maybe not often… but when you are forced to think about toilets, that’s what many would choose. For many people on the planet this is neither realistic or practical. The sanitized contents can then be put disease free into a landfill. It’s not an ideal solution, and ultimately they want to partner with organizations which have an interest in actually using the waste in more productive and sustainable ways. Meantime it at least prevents the spread of disease, contamination of water supply and other problems commonly associated with poor sanitation. Sanitation Creations was founded in 2011. Liz partnered with her childhood friend Dan, who has an accounting background. She said it was a perfect partnership because, "Not only did we potty train together. Now we are building potties together!" The company initially entered as a competitor for the Gates 'Reinvent the toilet challenge.' Though they lost out to the California Institute of Technology's solar powered toilet, they continued with the project, learning about business as they went. Though her work and a large part of her interest are in provision for developing countries her aim is to set up as a profit-making enterprise, rather than becoming dependant on NGOs and grant funding that might be pulled at any time. This allows them to make the product into a viably commercial enterprise and will give a more solid foundation for international work, where there is great social need but less profit to be made. Toilets are something we all should value. This is certainly a good month to show your support with World Toilet day coming up, and campaigns like #celebratethetoilet. You can support the IndieGoGo campaign for Sanitation Creations launch of the Dungaroo Here... and better yet, spread the word! If you start talking to everyone you know about toilets you'll be surprised to learn how interested they will be!